Thirty second sketch with marker, white pencil on paper bag. I love absolutely positively everything about this! Poor pooch - hopefully he's getting really good reception! OMG, your header is AWESOME!!!!!! Lo - you are amazing.... thirty seconds - on a brown paper bag.... and, there he is - adorable, a bit woeful, but, we KNOW he will make a full recovery and while he's healing, he can watch cat commercials! MEOW! 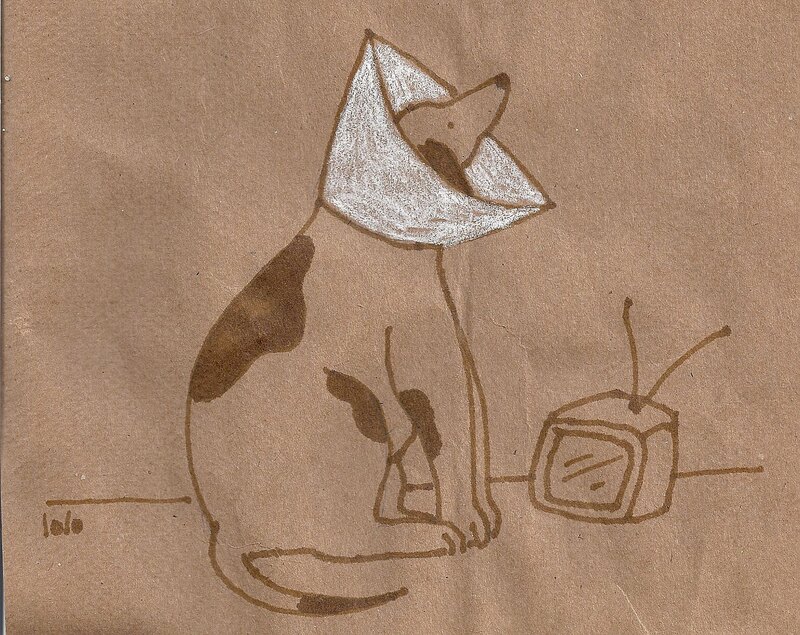 Nothing sadder than a poor doggy in a lampshade! Love your header. Yes, we're back from the long trip and have sold the camper; our doggy activities are keeping us closer to home; very satisfying and Scotland is have real summer! ohh, poor pooch... poor, but he looks so funny! ahahah! great drawing! I agree with everyone. That header is awesome. The poor little dog. I hate to see dogs with those things on. I know they are necessary but they look so pitaful with one on. Laurel, i saw Blogger took your comments away, perhaps they were a little envious, they were great comments full of love for you and sweet Stella. Our 8 month old puppy just got his cone thing off this morning, i am SO glad the last 7 days are done! And he is even happier than we are i'm sure! your illustration is beautiful. i love paper bag drawings! So here I sit laughing...it's not funny. Everytime I see a dog or cat in one of those, I just roar!!!! great take on the topic. beautiful drawing as well! I always think the vet should have to wear one of these. They suggested one for our Cat,,,HHAHAAHAHHAHAAHHAHA. She nearly killed herself and everything in sight, bouncing off the walls. Great, great little painting, Lo! Perfect...right down to the expression on the pups face. I love this! Paper bag art... COOL! Love your poor little puppy. He is adorable. 30 seconds ... impressive!! wonderful illustration and great uses of the color of the paper!! a-do-ra-ble and that header just takes my breath away. love ya too and thanks for the e mail. Teri is right nice header and the dog remind me of the RCA dog after he stuck his head to far into the speaker or wht ever it was he was facing, also reminds me of a show i saw as a kid not sure if it was "bewitch" or "my favorite martian" but it was something like that. awesome idea for this week's topic! Poor doggie. He is so cute. Your header is fabulous! And I also love your new header! Hope you will have a wonderful Sunday! So Cute!! I hope he gets his cone off soon! Great take on the topic. Very funny. haha, hilarious. Reception's terrible through those things I've heard. Gives new meaning to the word Coneheads.